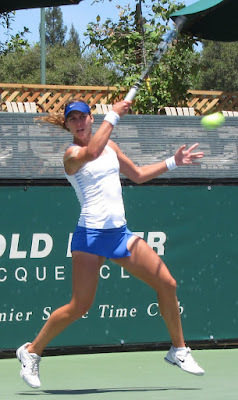 Maria Sanchez of Modesto and seven other Americans received wild cards into the prestigious BNP Paribas Open in Indian Wells, tournament director Steve Simon announced this week. The men's and women's tournament, which offers more than $12 million in prize money, is scheduled for Wednesday through March 17. Sanchez, a 23-year-old former All-American at USC, is ranked a career-high No. 111 in the world in her second full year as a professional. She soared 560 ranking places last year, more than any other player in the WTA, and won her first pro singles title in the $50,000 Gold River Women's Challenger in the Sacramento area. Joining Sanchez in the BNP Paribas Open will be Americans Steve Johnson, Tim Smyczek, Bethanie Mattek-Sands, Melanie Oudin, Madison Keys (19) and Taylor Townsend (17). Also given wild cards were former top-five players James Blake of the United States, David Nalbandian of Argentina, Tommy Robredo of Spain and 42-year-old Kimiko Date-Krumm of Japan, as well as Shahar Peer of Israel and 19-year-old Kristina Mladenovic of France. Peer reached No. 11 two years ago. College report -- Four pairs from Northern California colleges reached the round of 16 in the 124th annual Pacific Coast Men's Doubles Championships in the San Diego suburb of La Jolla. Advancing were No. 1 seeds Campbell Johnson and Christoffer Konigsfeldt of Cal, co-No. 9 seeds Denis Lin and John Morrissey of Stanford, co-No. 9 seeds Maciek Romanowicz and Robert Stineman of Stanford, and unseeded Adam Levie and Toki Sherbakov of UC Davis. In dual matches, the Pacific men (6-4) defeated host Sacramento State (3-6), 5-2; the Saint Mary's men (5-5) beat Santa Clara (8-4), 5-2, in Moraga; and the No. 9 Cal women (5-3) shut out Sac State (1-6), 7-0, in Berkeley.